I have noticed the cost of our utilities at our home is a lot higher than I think it should be. Especially since now that my wife's youngest is off the college, there are just two of us in the house these days. And I’m at my job eight hours a day. So that just leaves my wife who works at home. Mind you, we do have a good size house, but still how are two people using so much energy? Well, studying a wide range of topics and “how to” videos on YouTube I’ve been able to come up with a list of practical things we can easily do to cut our utility cost. Many things I already knew about, others maybe I forgot about, some just I learned. Here is a list I put together for my wife and me to start working on and implement into our daily household. I am hoping to cut our utility costs by 50 percent this year and put that money into fixing up our house with some needed repairs and upgrades. I thought I would share this as I’m sure you as well would rather NOT PAY big brother any more of your money than you don’t need too. For starters, changing out all light bulbs to LED bulbs. This can drastically reduce your everyday electric usage. For example, a 60-watt LED equivalent actually only uses about 8 watts VS a standard incandescent light bulb. A 60-watt incandescent light bulb uses 60-watts. If you have 30 incandescent bulbs in use that is 1,800 watts VS 60 LED 8-watt light bulbs put out the same light is only 480 watts used. And as always with lights, just turn them off when you are not using them. I am also looking to buy solar recharging LED light bulbs to be used in Lamp fixtures. These are generally used in the camping and RV/off-grid industries. But would work great for general home use. These bulbs look just like normal LED bulbs but can be recharged by placing in the sun. They then have adapters that added and can be screwed into a standard lamp socket. Then you would not need to plug your lamp into the AC wall outlet. For example, in my living room, we have end table lamps. We only run them a few hours in the morning and evening, while watching TV before bedtime. So with these lights, we could use no AC power at all in the living room for lighting. Then the bulbs can be recharged during the day for free, to be used again for the next use. There are other rooms in my house where this would work great too! Free lighting! I am excited to see how much money could be saved using these types of recharging lights all over the house. On the same lines a using rechargeable solar lights, I have been researching how to design a usable solar system to power simple appliances. LED lights, TVs, microwave, coffee maker, charging phones, and laptops can all be done easily with an inexpensive well designed solar system. Just five years ago the cost of installing a usable solar system was quite expensive. Since then the cost has come down to be very affordable. I have bought a 100-watt solar panel kit and have started experimenting with how it can be used in my house to run basic household items. More research will be needed on my part, and more solar panels and other items will be needed to design a system to successfully run these items on a daily basis. Obviously, living in Northern Indiana during the winter months can be a real challenge with getting enough usable sunlight to use a solar system. Designing a big enough battery bank, I have learned to be the biggest key with making a system like this usable for several days when there is no sun available to charge them back. Monitoring the usage of item's that tend to be left on or plugged in. I have learned to be another source of power consumption that is often overlooked. For example, cable or satellite TV boxes. We do have several cable boxes. The ones used the most are one in the main living room and one in our bedroom. Usually, we have always left them on while shutting the TVs off. I have come to find out that these cable boxes use a lot of power when on. I have also noticed that the usually when left on they stay very warm. Excessive heat means energy is being used and wasted. One cable box can draw as much as 40-50 watts of power, some maybe could be more. Leaving one box on every day would be like leaving a 40-watt light bulb on. Two boxes left on would be equivalent to two 40-watt light bulbs left on. What a waste of power. I have also noticed when they are shut off, they still are slightly warm, and lights are flashing in the back. Meaning, yes they are off, but still drawing a small voltage to keep the unit in stand by mode to power up very quickly. We have since been unplugging these boxes completely when not in use as well as other items like; TVs, lights, computers/laptops, wall power supplies/charging plugs, and studio gear when not in use. Utilizing power strips to turn off multiple items for easier use. Another plan of ours is to cook less with stove’s oven in the summer. Cooking in the oven causes the house to be hotter. even in the winter, although other than using energy, it may be desired to add extra warmth as a side benefit. We are looking into buying a decent size toaster oven and when possible use a toaster oven to cook simple items instead of heating up a large stove. Also do more grilling outdoors. Learning to cook the same items you would in a stove but on the grill. For summer and winter, this can save on electric or gas all year round. Eating colder foods that don’t need to be cooked would be another way to not run electric appliances. Probably one of the biggest cost expenses for any household is running the air conditioning in the summer and heat in the winter. So our plan is to run both less as possible. For summer getting used to setting AC temp at 73–75 degrees or higher. I know many keep their houses even warmer but for me, I'm always hot. Not so much for my wife. There are ways to help with the cooling in the summer to make setting the air up feel comfortable. One is to use a dehumidifier to remove humidity from the air. This will help the AC cool easier and run less. The standing air will feel cooler. In addition, utilizing small oscillating fans or overhead fans to keep the air circulating. Since running fans use electricity, I have been researching rechargeable solar fans. Also if I am able to set up a usable solar panel system, this would be a good use for it, powering fans. Setting the heat down would be the obvious next step for the winter. Getting used to keeping heat set no higher than 65 degrees. This is not much of a problem for me as I stated I'm always warm or hot. My wife, on the other hand, hates being cold. By utilizing a humidifier to add moisture to the air will add moisture and will help the furnace warm the air and not have to run as much. The standing air will feel warmer. 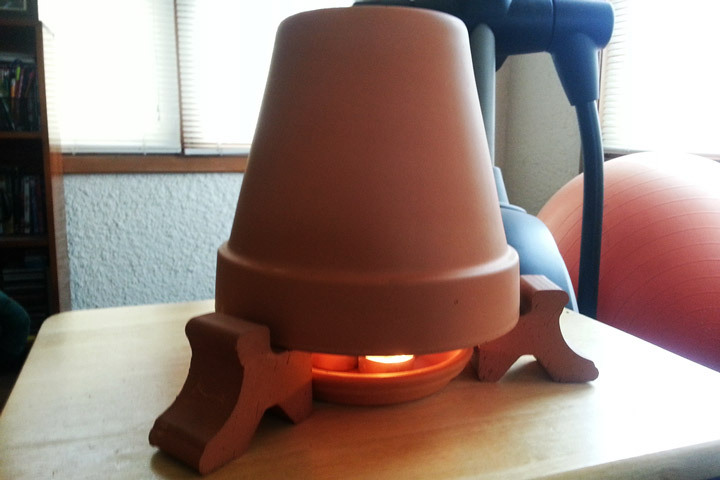 I have also researched using a ceramic flower pot method for providing cheap heat. These can be made cheaply and use standard decorative candles to heat the pots providing radiant heat. They appear to be very effective and can be a fun project to make as well. I have also been researching the advantages to adding a water misting system for the outside A/C unit. By keeping the unit cooler and coils clean, helps the unit to not work as hard and runs more efficient. This is something I will be adding this summer. Inspecting all windows and outside doors for air leaks. I have found many letting in cold air. By adding some sort of treatment for windows like saran wrap over windows, bubble wrap or weather stripping will help by keeping hot and cold air from leaking in. Another project, if possible would be to replace old inefficient appliances with newer cost saving more efficient appliances. I have been researching appliances designed for the RV and camping/off grid living situations. There are many products like stoves, microwaves, heaters, and air conditioning systems, washers and dryers etc that are designed to run on less power than standard household items using 120 vac. Obviously this would cost some money upfront but in the long run, would add up to savings. By changing out shower heads/faucet heads to more efficient lower water flow restrictive heads. They put out less water but have just as much pressure or “spray.” This saves on water usage, electric and the hot water heater running. With the subject of water heaters, I have noticed ours is set to high and we could set it down to not be so hot. Taking shorter showers can be another water saving, gas, and electric saving practice. Obviously, every household is different. But these seemed like very basic ideas and tips to help reduce the average our household utility bills. We have started by changing out 90 percent of the light bulbs in our house to LED and set the heat down as well as washing dishes by hand. I already have a small solar panel system that I have been testing and looking to expand on and design into a working solution for the house. It will be exciting and challenging to see if we can actually cut 50 percent out of our utility bills. After a few months of implementing as many of these options as possible, I will add an update as to what we have accomplished and saved.